Greetings from Deutschtown! April 2011 News, Events & More! Learn about all the wonderful things going on in Deutschtown: events, initiatives, progress, and what you can do to help. At the corner of East Ohio Street and Cedar Avenues you'll find the newest addition to the shops on East Ohio Street, sitting right at the corner of East Ohio and Cedar. Be sure to stop in and check it out. New sign alleged to be admired from the Space Station! Check out Zamir's new sign and, while you're at it, the new menu and free live music. 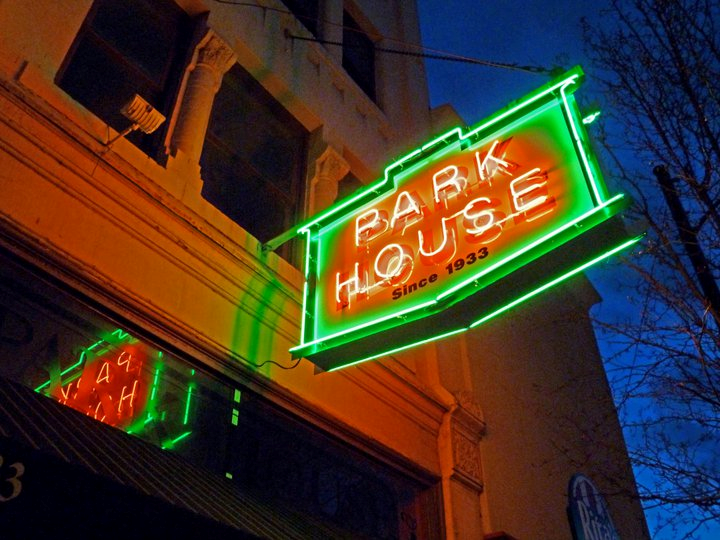 He's turning the Park House into a city-wide destination for live music (and free peanuts & popcorn)! Starting in April, our monthly EACC Community Council Meetings will be held at The Bistro Annex (behind Bistro to Go), 417 E. Ohio Street. Our meetings are held on the 2nd Tuesday of each month at 7 p.m.
Sunday, June 12, from 11am until 4pm will be an exciting day for our community, as we all join forces to showcase our fine homes as part of our Annual Deutschtown House Tour. The Priory will showcase its beautiful courtyard, and Citizens Bank has awarded the East Allegheny Community Council a $2,500 grant to cover operating costs. 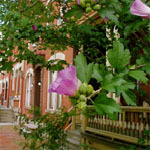 This year’s tour will build on the successes of the 2005, 2007 and 2008 house tours, which brought hundreds of visitors to the neighborhood. 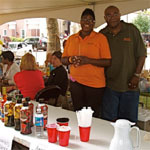 In 2008, over 30 local merchants and businesses purchased ads for the tour program. More than 40 neighbors volunteered to sell tickets, clean streets, tend to tour houses, prepare the tour program and collect advertisements. This year's tour will also feature a wine tasting event at the Priory Courtyard, as well as a brunch event at Bistro to Go. Amani Coffeehouse on Foreland has graciously offered to open their doors to serve as a restroom and beverage stop. Get involved in this promotion of our neighborhood, and show others why Deutschtown is a great place to live! To place an ad or volunteer, please contact the East Allegheny Community Council at 412-321-1204 or visit Deutschtown's website. For up to date information regarding the house tour, be sure to "like" our brand new Facebook page - Welcome to Deutschtown! The $2.3 million restoration of the Northeast Commons along the Cedar Avenue promenade begins Spring 2011 with the installation of new paths, lawns, trees, lighting and pedestrian amenities—providing a new home for the Farmers Market and other events. 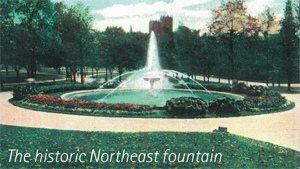 Fundraising is underway for the Northeast Fountain featuring a 50-foot central urn and surrounding water jets and for the promenade along North Avenue. From now until May 31, 2011, every dollar pledged to support park restoration will be MATCHED by the Colcom Foundation up to $100,000. Donate online at www.alleghenycommons.org or call Alida Baker at 412-330-2569 for a pledge form. The City of Pittsburgh is embarking on PLANPGH, the City’s first Comprehensive Plan. The purpose of PLANPGH is to create a shared vision and policies for the next 25 years of our City’s development. 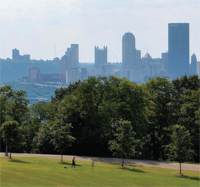 OpenSpacePGH, the City’s Open Space, Parks, and Recreation Plan, is one of the initial components of PLANPGH. This will provide the City with goals and strategies for its parks, recreation, and formal open space systems. It will assist in putting its vacant properties into productive re-use. The outcome of these meetings will create the City’s vision for its open spaces, parks, and recreation areas, so get involved and help make Pittsburgh an even better place to live, work, play, and thrive! In March, the Northside Leadership Conference presented $500,000 in grant money from Rivers Casino to eight neighborhood development and community groups for 11 projects throughout the Northside. Projects were chosen based on how well they met criteria set forth by the conference’s casino funds housing and business development committees. The main criteria, said Executive Director Mark Fatla, was that the projects visibly and tangibly improve the community, and be strategically important to the individual neighborhood as well as the entire Northside. 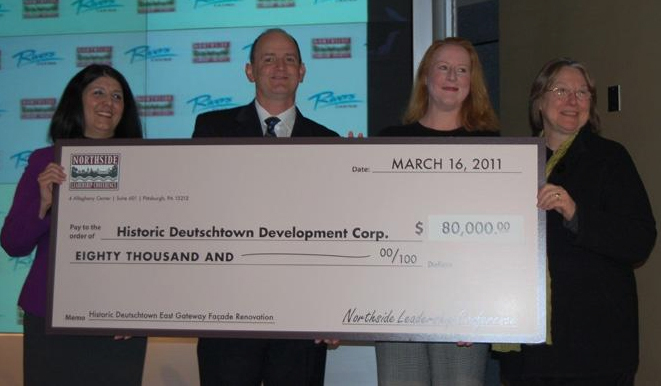 The Historic Deutschtown Development Corporation received an $80,000 grant for the Historic Deutschtown East Gateway Facade Renovation, as well as a $36,400 grant towards the Historic Deutschtown Branding Initiative and the Deutschtown Merchants Association. Councilwoman Darlene Harris is spearheading the City's Free Spay & Neuter Program, which is available to all city residents. City of Pittsburgh Animal Care & Control will determine an applicant's eligibility for the the program, and the department administrator will refer to individual shelter coordinators for scheduling. The program is free for any city of Pittsburgh resident, with a limit of 5 animals per resident (feral cat exemption on a case by case basis). Vaccinations must be brought current prior to surgery, and documentation is required to prove city residency and dog licensure. Full details can be found here. Tree Tender Course--Tree Tenders learn about urban forestry practices in Pittsburgh, tree biology, proper tree care and pruning, proper planting practices, and organizing plantings and care. Tree Tenders participate in plantings, pruning workshops, care days, identification walks, and more. Classes will be held at the Children’s Museum on Wednesday, April 6 from 5:30 to 8:30 p.m. Additional classes are scheduled for May and September. The cost of the course is $40 and includes materials, a meal, and a t-shirt. A reduced rate option is available for those on a limited income. On-site childcare can be arranged if needed. Contact Caitlin Lenehan for details at caitlin@treepittsburgh.org or 412-362-6360. Allegheny Library Spring Book Sale-- The Friends of CLP - Allegheny will hold its first annual Spring Book Sale to coincide with Earth Day, Friday and Saturday, April 22 and 23, 10 a.m. to 4 p.m. at the Carnegie Library of Pittsburgh on Federal Street. You can make your donations now through the day of the sale. Drop off your gently loved books and audio visual material at our library: 1230 Federal Street. All proceeds go toward the branch’s programming and collections. Please contact CLP Allegheny for more information at 412-237-1890. Deutschtown Neighborhood Cleanup-- In April, communities all over the world will be participating in cleanups to celebrate Earth Day.Pittsburgh clean-ups are held in conjunction with the Great PA Cleanup and the Mayor’s April Redd Up Program. East Allegheny volunteers will work on a cleanup, starting in the East Commons at Cedar and East Ohio Street on Saturday, April 16 at 10 a.m. To volunteer, or for more information, please call the EACC office at 412-321-1204. For additional Deutschtown happenings and news, Check out East Allegheny News: The Newsletter of the East Allegheny Community Council. Copyright © 2011, East Allegheny Community Council. All rights reserved.